Cambridge University Press, 244 pp. $27.99, paper. 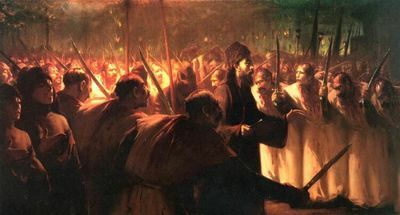 The Tenth of Muharram, depicting the battle of Karbala, by Ottoman court painter Fausto Zonaro (1854-1929). Haider's volume is by no means an introduction to the Shiite tradition in Islam. Rather, it is the author's analysis of features of Shiism that have drawn his attention, emphasizing details that for a reader little acquainted with the sect will likely be difficult to follow and of little interest. According to his Columbia University website biography, Haider is an assistant professor of religion at Barnard College, and his courses "bridge the gap between the classical and modern Muslim worlds with a particular emphasis on the impact of colonization on Islamic political and religious discourse." Haider is, therefore, not only fond of the more obscure aspects of Shiism but fashionably leftist and occasionally post-modernist in his approach. Thus, while discussing the transformation over time of the Khoja Shiites and their absorption into Niza'ri Isma'ilism, the reader is forced to suffer through rather predictable but, nonetheless, lamentable quotations from leftist sociologist Frantz Fanon and Palestinian apologist Edward Said, culminating in a sharp critique of the movement's current leader, Aga Khan, IV, for what Haider calls his "modernist" ideas and attachment to capitalism. For the author, the "collective memory" of Shiites, focused on the legitimacy of Muhammad's son-in-law Ali as successor to the Muslim prophet, his assassination in 661 C.E., and the subsequent battle of Karbala, in which Ali's son Hussein was slain, recede into the background. They serve merely as markers to distinguish between the main Shiite traditions: the Twelvers, the Isma'ilis, and the Zaydis. Comparison of the differences in narratives of Karbala among these groups—which focus on a cosmic significance in the martyrdom of Hussein among the Twelvers and Isma'ilis, and a less spiritual protest over the break in Muhammad's lineage for the Zaydis—provides a simple reference for scholars. For those who have some acquaintance with Shiism, this volume may prove a useful handbook in sorting out differences within the sect. For most newcomers to the subject, it will likely prove confusing and a waste of time.